Past collections and sold one off pieces. Some of the pieces within Archive are available to order. If you are interested in any piece from the Archive collection please contact Alice using the contact form in the main menu so that she can confirm availability and a price. 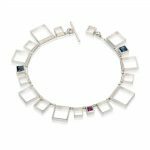 The beauty of this open square bracelet is its movement. Made up of lots of varying sizes of open square sections, some with stones set which move freely on the silver chain. 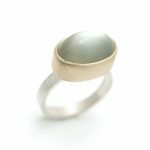 A contemporary addition to my collection of wide silver rings with semi precious stones set in 18ct gold settings. 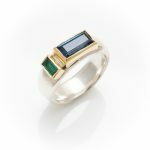 This one with a rectangular dark blue topaz and a gorgeous bright green Tsavorite Garnet. Size N If you like this ring but it's the wrong size please contact me as I can make something similar in your size. 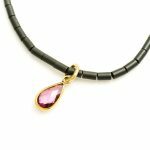 Beautiful and unusual semi precious stone drops set in 18ct yellow gold hung from single or double row of matt black hematite beads. 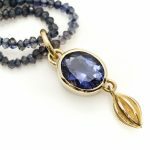 Available to purchase on other gold chains or beads on request, however the gold beaded chain shown is not longer available. These pendants have now all been sold, however if you are interested in something similar please contact me using the contact form. I may well have something in stock or can source and make something similar to those shown here. 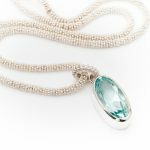 A beautiful and rather large Aquamarine pendant on chunky silver beaded necklace. A simple and elegant statement necklace for any lover of Aquamarines! Chain length 45cm with a ring and bar fitting. 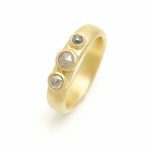 This gorgeous 18ct matt gold ring with simple grey rose cut diamonds has been made from recycled gold collected in my scrap pot over the past couple of years! 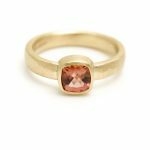 Its hugely satisfying to make something entirely from all the dust and shavings collected when making other gold pieces....don't worry it past the hallmarking test incase you were wondering! The beautiful round rosecut diamonds are in varying shades of grey. Its has a real Byzantium feel! Ring size O, (can be altered by a size up or down). 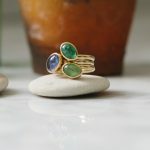 This set of 9ct gold stacking rings with semi precious stones can be worn individually or as a group. The ring bases are in a classic court shape, with a slightly curved interior edge making them incredibly comfortable to wear. 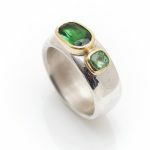 Shown here with Tanzanite, Savorite Garnet and Emerald. You should be aware that Tanzanites are more fragile than some stones and therefore some care should be taken when wearing these rings. Commissions welcome for different sizes and different stone combinations. Price will vary according to stones and price of gold at the time of ordering. 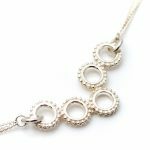 This gorgeous necklace is made up of five randomly arranged circles wrapped in tiny silver balls. 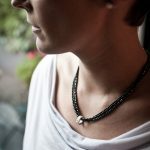 Inspired by pebbles on the beach, this necklace uses a technique called 'granulation', where tiny silver balls are arranged in a random or in this case more orderly configuration. It's very stylish and original without being too heavy or cumbersome. Perfect for daytime, evening, in fact most occasions! A glamorous necklace made up of three rows of polished Haematite beads with a wide silver ring link encrusted in tiny silver balls. Looks great worn with black or evening wear. Made to order can take between 2-3 weeks for delivery. 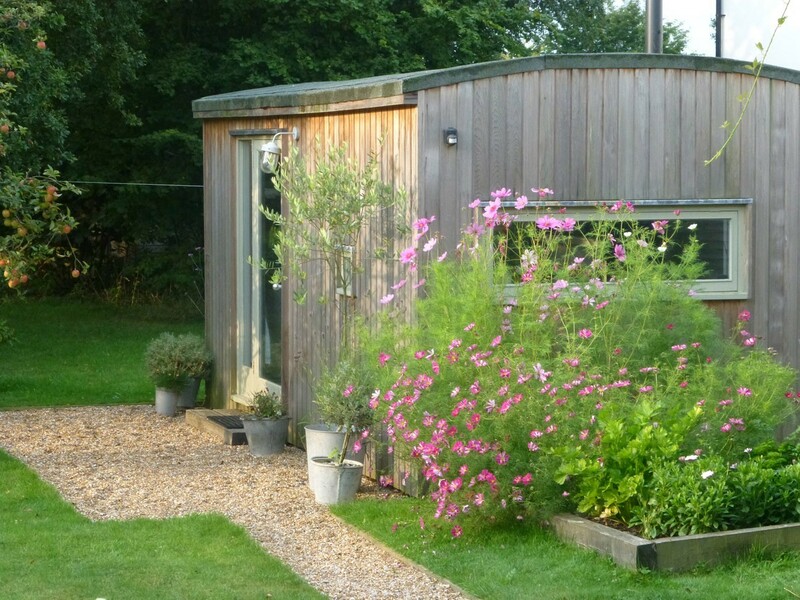 To confirm exact delivery timescales please contact us using the contact form.